Thanks to Camp Bow Wow®, there’s no need to leave your pets feeling lonely at home while you’re away. Our Certified Caregivers can come to your home to give your pets specialized care and keep them company. We take our jobs seriously and our commitment to your pets even more so. Our pet sitting services involve more than just stopping by to check on your pets—we provide the love and attention they deserve. If they have special requirements, we have the experience and dedication to provide them with the care they need. We are trained to administer medication and can care for post-surgery animals, puppies, and senior pets. Pet sitting. When you can’t be home for your pets, Camp Bow Wow has you covered. We design each visit to be as accommodating as possible. Vacation visits. While you’re away, we’ll visit your pets daily to take care of all their needs and give them lots of love and attention. Overnight stays. We can take care of your pet at every hour. Our staff will give your pet round-the-clock treatment with our overnight stays. Dog Walks. Because we understand the importance of daily exercise, we can schedule regular dog walks at a time that works for you. Poop scooping. We know you love your dog. What you don’t like is picking up their poop. Allow us to handle the less glamorous stuff. We provide more than just company for your furry family member—we also offer peace of mind. We hold our Certified Caregivers to the highest standards of safety and we are bonded and insured. Plus, all our Caregivers at Camp Bow Wow are background checked and certified to perform pet first aid and CPR and are extensively trained in caring for pets with special needs. 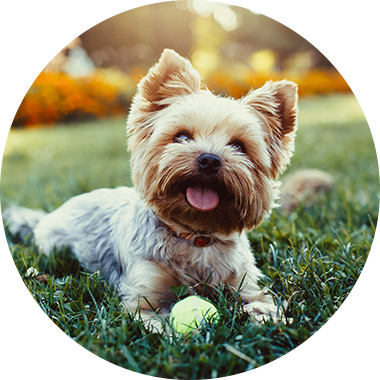 Let us create a custom in-home pet care plan that fits your pets’ individual needs. Schedule your FREE in-home consultation today! Get Started! Our Certified Caregivers come to your home and take care of your pets, providing love and attention – not just a quick potty break. Let us create a pet sitting program that works for your specific needs! Monday-Friday Only. Priced per month.